It’s here! But how do you pronounce “Takeshita”? 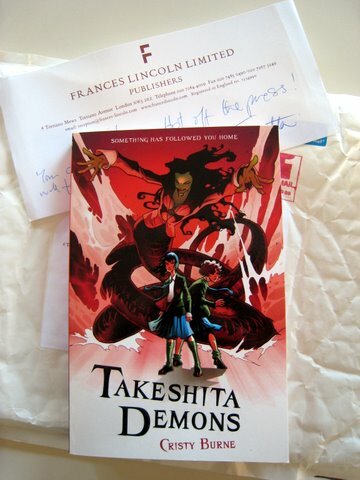 My first copy of Takeshita Demons arrived in the post! Wheee! It’s very strange, and it certainly doesn’t feel like “my” book. The letters that spell my name on the cover just seem to be some random jumble of foreign symbols. Very odd. Don’t you think it looks GREAT!!! It’s the one question everyone is certain to ask me, and, if you’ve ever studied Japanese at school, you might have an idea. The word “takeshita” is made up of “ta-ke” or 竹, meaning bamboo, and “shita” or 下, meaning beneath. KE: “ke” is the same as in “kettle” or “kennel”. How do you write “takeshita” in kanji? I met some cool kids at a wedding on the weekend (and two of them, incidentally, spoke Japanese!) and it was ace to play with them on the kiddies’ table while all the adults made conversation instead. We played heaps of games, including “I give you”, which we made up on the spot. In the game, you take turns giving each other imaginary gifts: you can give powers, or magical instruments, or, if you think someone’s getting too many powerful gifts, you can give them a giant toad or an empty swimming pool, just to even things out 😉 It was GREAT! One of the greatest bits about being an author for children is that you get to play with kids. YAY! Tags: "takeshita", announcement, cover, games, Japan, language | Permalink. Aloha from Hawaii – again! I just finished reading Monster Matsuri and enjoyed it very much. I had to chuckle when I read about Miku’s lineage – I’ve been telling people that for years. I hope there will be more in the Takeshita Demons series and I look forward to reading them all. Have a great 2012 and watch out for those noppera-bo! Sorry for the extremely long delay since my first comment. 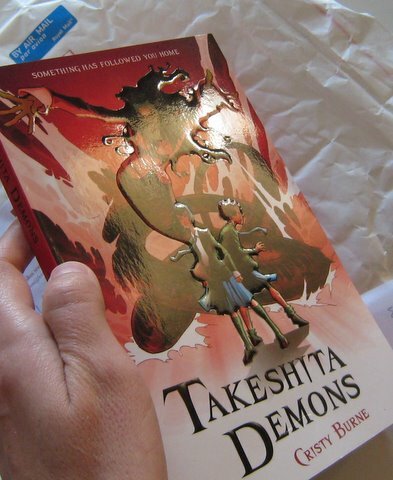 I read Takeshita Demons and enjoyed it very much. I ordered two additional copies from Amazon and donated them to the elementary school in my neighborhood. I’m hoping the Asian connection will pique students’ interested in reading. Yes, I’m an educator but have long since left the classroom to be an administrator. I just received my copy of The Filth Licker.. It is not available in the US yet so I ordered it from a London bookseller. I pre-ordered Monster Matsuri from the same company because they will have it months before it will be available on Amazon USA. I will of course order additional copies of both of books when they become available on Amazon and donate them to the school to complete the set – and will do so for any future books in the series. I don’t know if there are more noppera-bo in Hawaii, although I chuckled when I read that in The Filth Licker…. and hope I won’t ever find out! I chose Takeshita for lots of reasons, some of which are important to the plot (so I can’t tell you now ;-)) but one of the best reasons was for TAKE, which, as you know, means bamboo. I like the idea that bamboo is strong and resilient, that it will bend in the wind but will not break. That suits Miku’s character, and that of her family. I really hope you enjoy Takeshita Demons! And PS: Is it true that Hawaii is one of the hot spots for seeing noppera-bo? How exciting! Thank you for the nice explanation about how to pronounce Takeshita. Here in Hawaii many people (some in my family are guilty) pronounce it like they are reading hiragana – sound by sound so my family name becomes Ta – Ke – Shi – Ta. I have been correcting people for years. I’m wondering – how did you decided on your character’s name? I just placed my order for your book on Amazon and I’m looking forward to reading it and sharing it with my family. Giddy up!!! Awesome news Siege!! !